EDITOR’S NOTE: The following review contains some plot spoilers. Too much of anything can get boring. 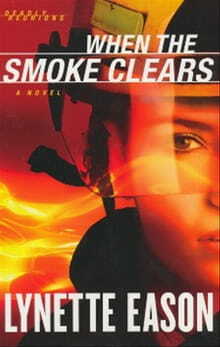 However unintended, that seems to be the lesson from Lynette Eason’s latest thriller/romance, When the Smoke Clears. If you like action for its own sake, you’ll want to stop reading this review and just read the book, because there’s plenty of action to keep you satisfied. Otherwise, if you need action in a story to fit into a cohesive framework, you might be thankful you read this review first. Eason introduces us to a young lady from South Carolina named Alexia. Brought up on the wrong side of the tracks, Alexia leaves town upon graduating high school and unable to shake accusations of being an arsonist. Ten years later, as a firefighter in Washington State, she finds herself the victim of suspected sabotage on her firefighting equipment. While on leave, she decides to return home to visit her mother and attend her first high school reunion. Upon arriving in South Carolina, the violence never lets up. Somebody is murdered in her mother’s house, Alexia herself is attacked in a parking garage, Alexia and the cop protecting her are sprayed with gunfire in the same parking garage, the house of another cop gets destroyed by arson, the cop’s car gets blown up, two other cops get strangled to death, and that’s just a sampling of the mayhem. Interspersed among all this are random cut-aways to a senator being stalked by somebody with some humongous secret about him. But we never learn what that secret is. When the Smoke Clears is Eason’s first book in a series she’s calling Deadly Reunions, which suggests we’ll have to wait for other books to get written before we can start piecing things together. But the wait barely seems worth it. And that cop protecting Alexia? It takes him forever to figure out she’s in mortal danger. Despite all this violence, life seems to plod on for this police department, which in any other city, would probably be operating on ultra-high alert. Instead, the officer whose home is destroyed apparently simply moves on with her life, Alexia thinks a conventional home security system provides sufficient protection from a murderer, and the cop supposedly protecting her lets her attend a high-visibility function where she finally meets her enemy. I say “finally” because this plateau in the plot spells relief that the end is in sight. Yet Eason still never provides the carnage any coherent anchor. And the person hunting Alexia? Turns out, that person is insane. What a weak justification for a suspense novel! Insanity, legally, covers a multitude of sins, so Eason attempts to sweep up her plot’s wreckage under the rug of her villain’s mental condition. How disappointing, after reading through one disjointed attack after another, hoping for some brilliant resolution. Unfortunately, there is no brilliance here. In fact, some apparently sloppy editing has the senator contradicting himself with his instructions to his thug chasing Alexia. And as far as the romance angle of this story goes, I’m starting to feel sorry for all the short Christian single guys out there. “Handsome” may be in the eyes of the beholder, but there’s no getting around the fact that these beautiful heroines always go for the tall guys. At least Eason gives the Gospel of Christ a good airing in multiple spots of her story. The Bible tells us that wherever Christ is proclaimed, his words will have value. And speaking of salvation, the realistic testimony of Eason’s characters is the only thing that redeems When the Smoke Clears.